Ladies, let me ease your plummeting self-confidence as you see female celebrities walk down a red carpet – not only did they NOT wake up like that, to look the way they do, most of them start preparing weeks in advance. I have to say that I was relieved to discover the amount of work that goes into making Charlize Theron and Rihanna look the way they do on a red carpet, there are only so many genetically gifted people allotted per planet! We all know leading ladies are dressed to the nines, with their hair and makeup done by a glam squad who spent hours and hours taking over the celeb and her house. That’s not news to me. However, when I learned of the much longer term and invasive steps that these women take, I cringed at some, laughed at others, and secretly wished I could try them all! A vitamin B12 shot essentially makes you feel like you just drank a pint of espresso without the jitters. According to Dr. Jeffrey Goldstein of the Fountain Med Spa in NYC, the shot, given the morning of the award show, makes you “more alert, more energetic, more focused – we have the ability to do more.” The extra bonus of the shot is that it’s a great hangover remedy (just for that we’d try it!). I knew those pearly whites couldn’t be naturally that white! It seems like every single woman in Hollywood has a perfect smile, I was beginning to think they were all going to the same guy. Alas, in preparation for an award show, celebs go to their resident dentist to get a tune up on their teeth whitening, making sure their smile is as perfect as they want the world to think it is. My mother always said – you can’t put makeup on bad skin, it won’t look good. She had a point. This is the reason the skin climbs several places on the priority list around award season. Makeup is not enough to conceal the skin of these women, they need to treat their skin at the base level. Stars like Michelle Williams and Emma Stone use a diamond peel microdermabrasion that’s topped off with a hit of oxygen to kick the skin into shock. Other women in Hollywood use electric current during their facials to tighten the facial muscles and skin while removing unwanted puffiness. While there are plenty of young and naturally plump women in Hollywood, there are those that are transitioning into (dare we say it) middle age, gasp! And are fighting it tooth and nail with the help of Botox and other such fillers. As award season approaches, celebrities flock to their cosmetic dermatologist to get filled what needs filling and removing what needs removing. 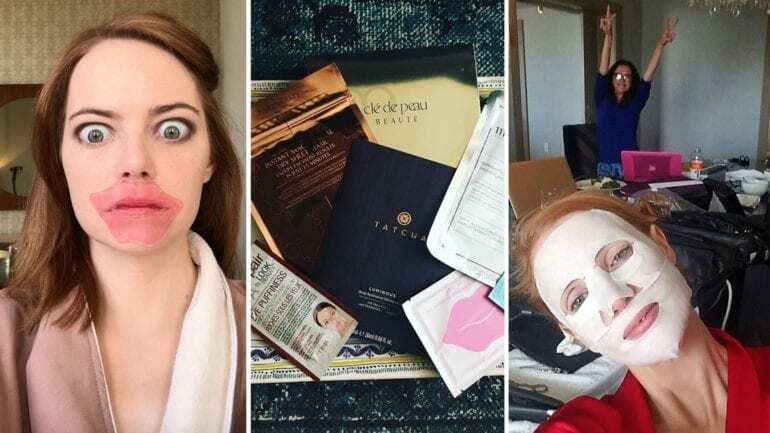 Anything to do with skin is done at least a month before the award show to make sure there is no allergic reaction or visible mark by the time the red carpet rolls around. So you know those ridiculously beautiful gowns celebrities wear to the show? Well, unless you are Meryl Streep or Lady Gaga, you need to either buy your own dress or be a size 0-4 to fit into a sample size gown that is being loaned to you. Since we all like free stuff, especially when that free thing is couture gown, this is where meal plans come into play. Companies like, Sakara see a spike in their organic meal delivery service clientele during the weeks leading up to the show. Four weeks is the bare minimum celebrity women will go without eating anything that could add a pound to their frame. As I said, getting into the dress is very important, in addition to looking killer in it too. In the weeks leading up to the award show, celebs like Juliana Rancic of E! Channel, make sure to schedule extra personal training sessions to get as much into shape as they possibly can. Honestly, with a number of cameras pointing their lenses at you, I would be booking myself into every Soul Cycle class I could. The pressure is on. So now that we had our teeth whitened, our skin cleared, plumped, and our waist smaller we have arrived at the day of the award show. Most celebrity women wake up early on the day as preparation takes several HOURS. There is hair, makeup, nails, dressing, and the candid photos taken by the glam squad to make sure they get the credit that is so due to them. Hair takes forever because it’s usually done in stages, depending on the ‘do, while makeup takes just as long as you would not believe the amount of makeup that is put on these already stunning women’s faces. Some hair stylists meet with their celebrity client weeks in advance when coloring is needed – no one wants roots on the red carpet! As we mentioned, the skin is also prepped weeks in advance to make sure the canvas is as clear as possible.